Off the Hook Astronomy: All hail the chief! A few months ago, when the american presidential election campaign was in full swing, I received in my weekly Lion Brand newsletter a pattern for Obama and McCain finger puppets*. Though I don't care much for politics, I'm a liberal at heart, and so my views are much more aligned with those of the democrats than the republicans, so I decided to make the Obama finger puppet (though one of my friends insisted I make both so that they could fight, gladiator style). Now, despite my general apathy about politics, and despite the fact that I'm canadian so american politics shouldn't matter so much to me, something about the Obama campaign really inspired me. Compared to the previous president, he just seems like such an intellectual, who really has the best interest of his citizens in mind. That and he's the first black president, which really is a huge step for americans. 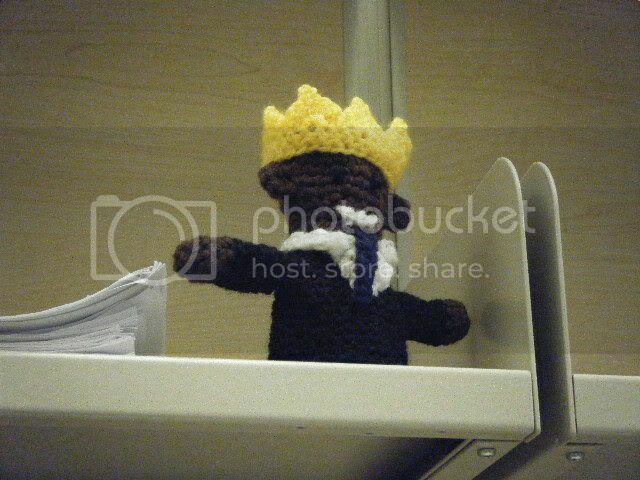 So after he won the election, I was so excited that I designed and made a crown for him. *Note that to access the patterns, I think you have to have an account on the Lion Brand site. It's free, so if you're really interested, it only takes a moment to make an account.